You may use Cryptlib subject to the restrictions below after you have obtained a valid software license. Cryptlib is distributed as ‘open source’ software but NOT for free. NB: No software license is required for evaluation purposes. If you make any changes to the code, you should send a copy of the changes to the author or authors to allow them to integrate them into the code. This is to allow a central consistent version to be maintained. Any software you create with this code may not be merely a set or subset of Cryptlib, with or without minor added functionality or a different interface. In particular you can’t distribute Cryptlib (or any modified form of it) as your own encryption product. This is to stop developers adding their own wrappers and selling it as “their” encryption product. All “commercial use” of Cryptlib requires a software license. “Commercial use” means any revenue-generating purpose such as use for company-internal purposes, or use of Cryptlib in an application or product, with a total gross revenue of over US$5,000. This allows Cryptlib to be used in freeware and shareware applications and for research purposes and non-revenue-generating personal use without charge. Freeware and shareware users must still obtain a valid software license. In addition the author reserves the right to grant free licenses for commercial use in special cases (for example where there is a general benefit to the public), contact the author for details if you think you qualify. Note that decoupling the software from the user, for example by running in a SaaS (Software as a Service) configuration, does not exempt you from the stated licensing requirements. 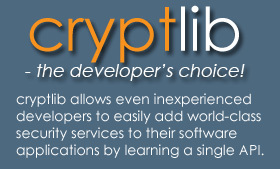 We encourage programmers to disseminate Cryptlib as widely as possible.